As usual, the annual issuing of the Council of Europe stamp is awaited by stamp collectors. 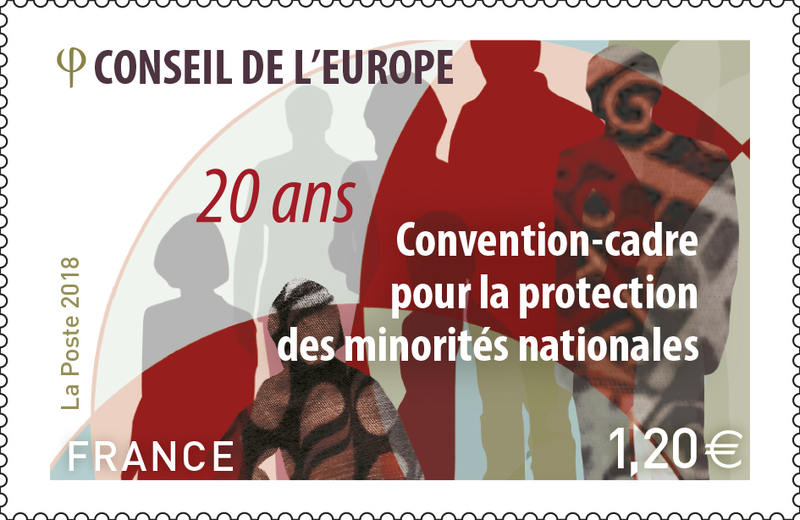 This year, the stamp celebrates the 20-year anniversary of the Framework Convention for the Protection of National Minorities. The first viewing took place during a stamp-collecting event at the Council of Europe on 12 October 2018. As early as the 90s, war and political and economic upheaval proved that protecting monitories was essential to achieving stability and peace. Thus, the Council of Europe drew up the Framework Convention for the Protection of National Minorities. The Convention came into force on 1 February 1998 as the first legally-binding multilateral instrument dedicated to protecting minorities at global level. The Parties to this Convention pledge to promote the full and effective equality of minorities in all areas of life: economic, social, political and cultural. It guarantees the freedom of peaceful assembly, freedom of association, freedom of expression, freedom of thought, conscience and religion, media access, and linguistic freedom. In 20 years, the Convention has contributed to governmental approaches to diversity in European societies: legislation on minority rights has been adopted and school curricula have been revised to give space to minority languages and create new forms of minority participation. The Convention will be an essential point of reference in the future for raising the profile of national minorities and fostering their integration.